Researchers just listened in to some of how the brain "talks" to the immune system. Even when you’re asleep, your brain is on. It’s constantly communicating with every part of your body, sending electrical impulses and specific chemicals throughout your muscles and organs to keep everything running smoothly. We know some of the basics of how this works, but to be honest, most of it is still pretty mysterious. 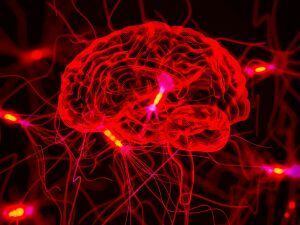 Now researchers have taken a big step towards understanding the “language” of the brain — they identified how two types of compounds called cytokines interact with the nervous system, according to a study published Monday in the journal PNAS. Cytokines are critical to our immune systems — they are the signals that the body when to attack a potential threat, and when to back off. These two cytokines in particular, IL-1β and TNF, specifically tell the brain to trigger inflammation. The researchers experimented on the vagus nerves of mice, which connect their brains to many of their bodies’ vital organs including the heart, lungs, and gastrointestinal tracts. They hope that down the road, findings like these can help hijack the brain’s natural tools to treat chronic disease. In doing so, the researchers made a major contribution to the emerging field of bioelectric medicine, which seeks to treat disease by modifying the signals sent back and forth among nerves. In the past, bioelectric medicine has shown promise for treating diseases like arthritis or asthma, but has been held back by fundamental questions of neuroscience, plus limitations of biomedical engineering. Those are, admittedly, pretty big hurdles. While the current research is still far from changing how we treat disease in humans (after all, most animal studies don’t pan out when applied to human biology), the new findings show that we can make progress towards figuring out how the nervous system communicates with the rest of the body. The two cytokines the researchers identified in this study could someday help control how and when inflammation occurs, but their methods hint at a bigger picture. If their methods can alter other signals between nerves, then they may be able to map out specific ways in which they communicate. It would take a lot of work. But if they succeeded, scientists would have many more levers to pull as they fine-tune our bodies’ immune responses to any number of diseases. These findings, and bioelectric medicine at large, certainly aren’t a miracle cure. And let’s not confuse them with homeopathic “treatments” that (falsely) claim we can think our way out of health conditions. Instead, they offer a promising new way to use the biological tools in our body to better fight off diseases and other problems. So, yes, medical interventions based on yesterday’s findings are far off in the future. But there’s reason to expect that some new treatments will come of all this down the road.